Over at the Lady Hamilton site there is a good version of the Hughes Logo in DOC format. This works well unless you need a larger version. I created a vector format of the logo to make it easier for large format printing of the logo. Click on the image below for the SVG format. These can be edited with any vector capable program, I like the open source software InkScape. This is my 100th post on afloat.ca! scouts.afloat.ca - a site for the scout group that I am a leader with. Also hosts our adventure racing page. staying.afloat.ca - a site for general business commentary. This isn't very active these days. android.afloat.ca - this is a new project where I am going to document the use of android apps for sailing. ar.afloat.ca - a sister site for the adventure race that my scouting group hosts. General adventure racing tips and tricks. I started this blog in January 2009. I wanted a place where I could document the bits of information that I found useful or that I thought others might find useful. If there is a topic that I need to figure out, I may as well make it easier for someone else to find the same info. In May of 2009 I purchased the domain afloat.ca to make it easier to find. 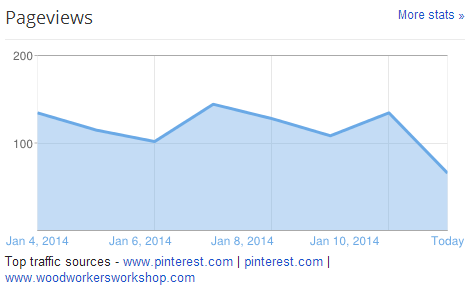 Since inception I have received, as of January 12, 2014, 92,534 hits on the site. Basically I am averaging around 1000 hits per page. I am now averaging approximately 110-150 hits per day. This isn't a high number compared to big blogging sites but I am definitely happy to think that I might be having some sort of helpful impact with my posts. The loft bed plan page is my highest hit count by almost double. Apparently people are attracted to free things. Who would have thought! What I have found is, since I don't have a lot of subscribed users, people are finding my site when they have a specific problem they are trying to solve or when they are making a specific buying decision. I have found, not surprisingly, that there is a definite seasonal pattern to hit counts. Snowblower hits skyrocket in the winter of course! Also not surprisingly, if I put some effort into posting links to my articles, my hit count goes up. I'm not really interested in optimizing my SEO so I don't really do this often. I don't have infinite amounts of time. I enjoy writing but there are a lot of other things to occupy myself, like actually doing projects. The benefit of watching the stats on posts is that I can actually tune my topics to what people find useful. I have no desire to post for the sake of posting. I have enjoyed the first 100 posts on this site and look forward to putting out another 100. The next step in the disassemble process was to remove all of the cooling related pieces. All of the cooling lines are going to need to be replaced as they are disintegrated. Remove thermostat - The thermostat is held in place by two 9/16" nuts. There was no gasket on the thermostat. I tested and cleaned the thermostat. The water pump is attached directly to the accessory drive bracket with two 9/16" (1" long) bolts. I removed the impeller for inspection (and because I haven't had a good look at the impeller housing before since my current engine's is crammed in the worst ungodly position in my engine compartment). The impeller was in good condition but I will replace it since it is old. The impeller is held on with 4 flat head machine screws (1/2" long). There is a full description of each part in the impeller system on the Moyer impeller parts page. The o-ring gasket on the impeller plate is missing, or so disintegrated as to not be recognizable. I will replace that on reassembly. There is a gasket on the drive side of the assembly. It will need to be replaced. The accessory drive is held on by two 9/16" bolts (2 7/8" long). One of these bolt heads is stripped and will need to be replaced. I couldn't remove the other bolt fully yet because the engine mount is in the way.